Lenovo's first Yoga tablet, introduced late last year, met with bad reviews, so the company hopes the second time's a charm with the Yoga Tablet 10 HD+. Announced at Mobile World Congress in Barcelona, the US$349 tablet has a 10-inch screen and a snappy Qualcomm 400 Snapdragon processor. The screen displays images at a 1920 x 1200 pixel resolution, setting it apart from the previous Yoga 10 tablet, which was criticized for its poor performance and low-resolution screen. 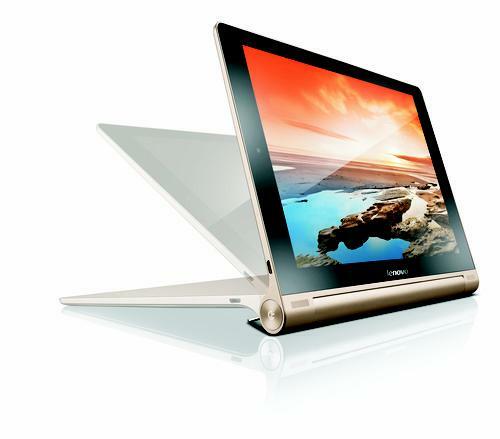 But the company has retained some of the key features from the original Yoga 10. The Yoga Tablet 10 HD+ has a cylindrical battery that the company claims gives the device 18 hours of battery life, and a kickstand that allows the tablet to stand upright at 30-degree to 80-degree angles. Other features in the tablet include an 8-megapixel rear camera, a front camera, micro-USB port, Wi-Fi and Bluetooth. The tablet has the Android 4.3 OS. The Qualcomm Snapdragon chip is able to render full high-definition video, which should give the tablet competitive multimedia performance. The tablet will be packaged with apps from Lenovo to easily share files, sync contacts and protect the device from malware. The software belongs to Lenovo's new Do-it software apps package, which was also announced on Sunday. The Yoga Tablet 10 HD+ will be available in April, the company said.